When it comes to ER overuse, the statistics are harrowing. 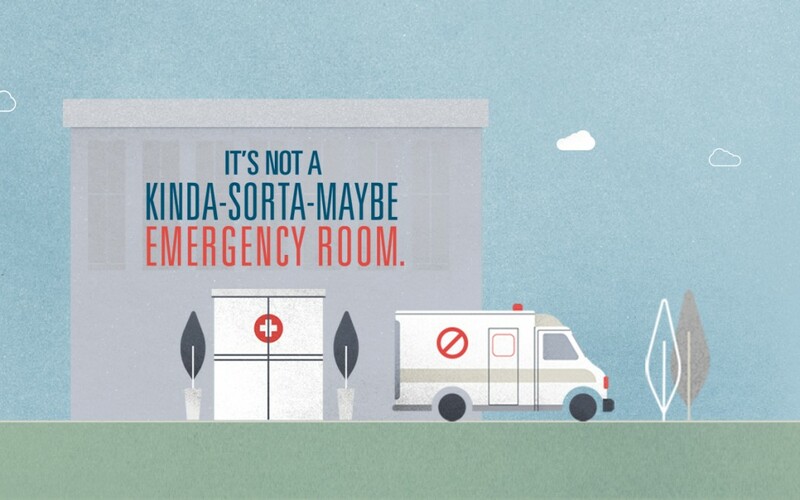 Of all the 128 million ER visits a year, a whopping 63% aren’t even emergencies – and only 11% end up checked into the hospital. And while that might not seem like a big deal – you needed care, right? – it actually translates to $38 billion a year in waste. Wasted time. Wasted resources. Wasted money. But let’s face it. As parents and caretakers tasked with making difficult decisions in times of crisis, knowing the right call in that moment can be a challenge. When our loved ones are sick, we’re overwhelmed with emotion. And that emotion and stress often mean we’re not the best at thinking on our feet. When my son was two, he spiked a serious fever. My usually spunky and non-stop child could barely keep his eyes open or lift his head, let alone respond with more than a sigh. After giving him a dose of Tylenol and noting that his temperature hadn’t gone down – he was hovering around 103 – my husband and I decided to take him to the Emergency Room. Why? Because we were scared. And he was our first child. And the Internet only gave us horror stories of parents who hadn’t taken their feverish kids to the doctor in time. We went through the Emergency Room dance – which included waiting for over three hours to be seen — and when all was said and done the ER doctor explained that when Tylenol (acetaminophen) doesn’t work, always try ibuprofen. Because within about six minutes of my son getting a dose of the stuff, he was back to his cheerful, fever-free self. My husband and I exchanged embarrassed glances. We’d never even contemplated using ibuprofen. And it would have saved us a great deal of time… and money. If we’d only known there were other options. Even though the visit hadn’t been an emergency, it was still billed as an ER visit. Not good news in a time in our life when finances were tight. One dose of syrupy children’s ibuprofen essentially cost us our $500 emergency room deductible. Sure, it cost us $500, but that was just part of the overall bill. It wasn’t just my time that was wasted, but the health facility, the doctors, and all those administrative costs. So what do you do to make sure you’re making the right choices for your family’s health and your family’s finances? How do you cut down on ER overuse? You make a plan. If you’re anything like me, you know that in a moment of emotion or stress you might not make the right decision. Putting a plan in order and educating yourself about options is the first step. The truth is, you have lots of options when you or a loved one might be sick enough to see a doctor, and most of them don’t land you in the ER. Those include calling Health Line Blue, our toll-free nurse line. For many of our customers, this service is available around the clock for free. On the other end of the phone is a trained nurse, ready to answer your questions and help you make the best decisions about what to do next. If I had called Health Line Blue when my son’s fever wouldn’t budge, chances are I’d have heard the same advice I got after three hours at the ER. Convenience care centers are the next line of defense. These locations include options like CVS minute clinics and Target clinics, and are ideal for allergy symptoms, cold and flu, minor burns, and sprains or strains. Definitely good in a pinch, and with next to no wait. Then comes Urgent Care. Depending on the center, many are open quite late, sometimes even past 8pm. With an average wait time of 11-20 minutes, urgent care centers are top of the list when it comes to being efficient, too. Not to mention the cost is a fraction of what an ER visit might be. If you don’t know where to start, BCBSNC has made it easy to find Urgent Care centers – just use the Find a Doctor Tool here. Yes, there are cases when you need to get to the Emergency Room—especially if something is life threatening. But remember there are specific criteria as to what constitutes to an emergency. 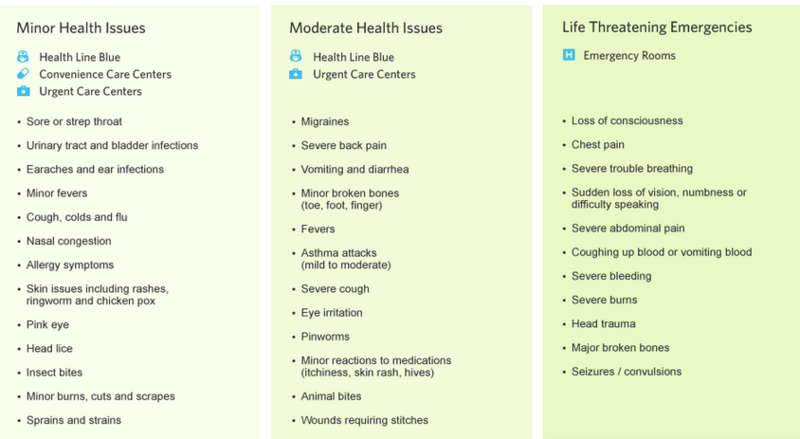 Take a look at the infographic below to get a better idea of how symptoms stack up, and how you can make the right call. The costs and savings go both ways. Not only does cutting down on ER overuse help you save money and time, but it means that ER doctors and nurses can spend more time working on true emergency cases. That real emergency could be you next time, or one of your loved ones. Being sick is stressful, especially when it’s unexpected. But take a lesson from my experience: By spending time to put a plan into effect ahead of time, you can cut through the panic and use the right health care solution for the right health problem.